To Moms across our country who have sons and daughters guarding our nation’s ramparts in this time of war, my family’s thoughts are with you on this Sunday morning. Your trials and suffering, the fear late at night and the questions that linger in moments of solitude are understood by so few. Yet without your love, support and endurance, the defense of our country would not be possible. Yours is a journey few ask for, but many need. Bless you, and may your sons and daughters return home soon to your loving arms. Today we kick off our theamericanwarrior.com podcast series! This week, we’ll be talking about a little-known characteristic historians have in common–the way we name our pets. Hope you’ll listen in as Renee Bruning and I (John R. Bruning) chat about World War II battles, Civil War generals and foundling kittens. I wanted to take a moment and thank each of you for coming to visit my little corner of the web. Last year, the site’s readership exploded. We went from having a few visits every month to thousands a day at times, something that both elated and surprised me. As a writer, there is nothing more gratifying than seeing the words we write resonate out there and find an audience. I read that book to my daughter, Renee when she was little, and that passage always stuck with me. Every time we’ve had a book released, I circle back to that quote and wonder where the winds will take it. With this website, I don’t have to wonder, the feedback is virtually instantaneous, something I truly love. I’ve sat here in wonder looking at all the folks from around the world who have come to look at my words, the photos and videos here, and I cannot help but to marvel at this amazing technology. I am profoundly grateful for every visit. So thank you, Dear Reader. Your interest has made this site a focal point of my life. In the months to come, we’re going to be leveraging technology even more here. 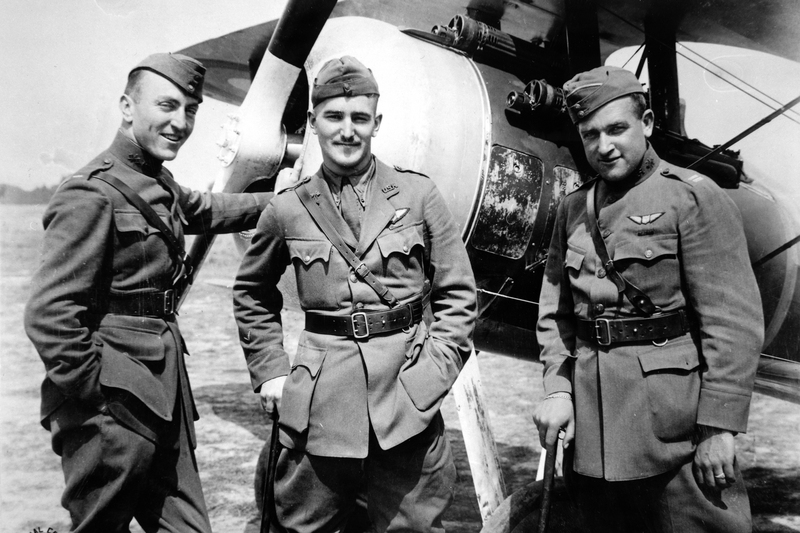 We’ll be starting a podcast series soon that will cover a rage of topics and highlight plenty of nearly forgotten American warriors. I’ll be bringing in some guests, doing some interviews, and having a lot of fun with the studio equipment we just picked up to pull this off. We’re working on a new mini-documentary that we’ll serialize here later in the spring. 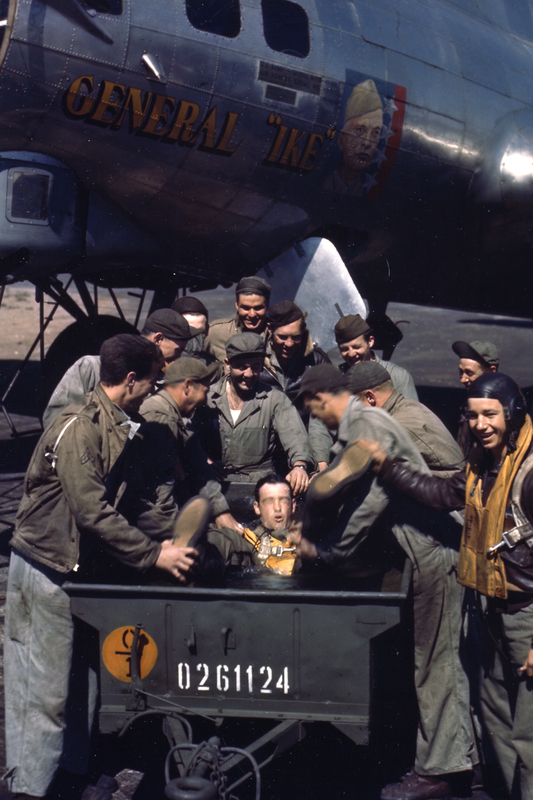 We’ve acquired some color footage rarely seen before from both the ETO and PTO during WWII, and we’ll be acquiring more over the coming year. 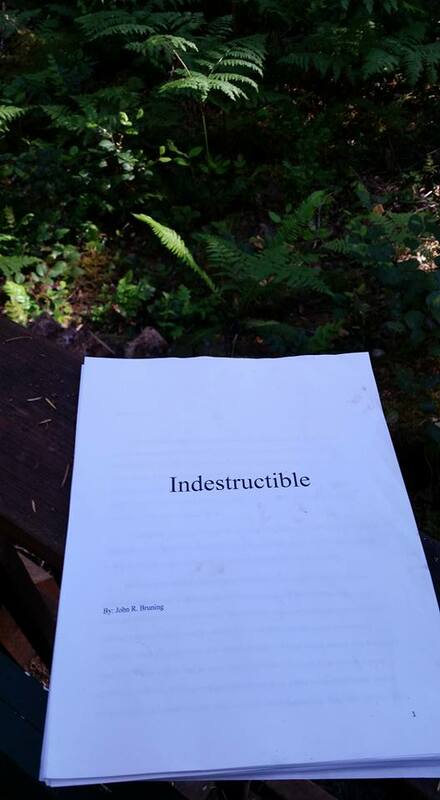 On May 3rd, Indestructible will hit bookstores. This is a book I’ve wanted to write since I was a kid marveling at the tales told by George Kenney and the likes of Ed Sims & Martin Caidin in their books. Indestructible is the story of Pappy Gunn and his family’s experience during the Pacific War. In researching the book, I compiled something like 30,000 pages of documents and many, many stories about Pappy that we did not have room to include in the main narrative. To support the release, throughout May and June, I’ll be posting additional stories, documents and videos about Pappy, his family and friends. A little later this year, I’ll be embedding with an artillery battalion during their annual field training exercise and will be posting stories, photos and videos about the men & women behind the guns. We’ll also be following up on some of the stories posted last year. Most notably, thanks to y’all out there in cyberspace, The Last, Lost Letter reached Frank Christen’s surviving relatives. Though his widow passed in 2004, his sister and her family finally received closure and read Frank’s final words home. When his family contacted me…well, all I can say is that have been few professional moments in my life more powerful and rewarding. So stay tuned for an update on that article in the weeks ahead. Of course, we’ll be updating Gwenie’s story. Our Jordanian refugee continues to grow, get into trouble and cause mayhem wherever she goes. We’ll be following year two of her experience in Oregon after being rescued in Amman by Captain Cassie Wyllie, one of my favorite humans. Thanks again for making this all possible. Looking forward to a tremendous 2016, and thank you again for your interest and support! You are part of a legacy of service that transcends national interest, but fights for basic human rights. For two hundred years, those who have worn the uniform have stood in the eye of the storm to protect those basic human rights. 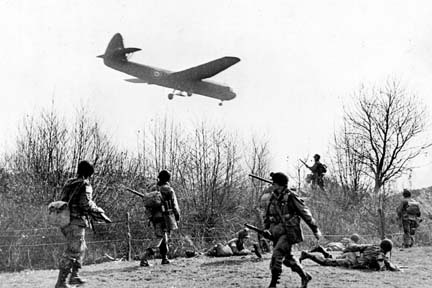 From the outset, Americans in uniform have changed the world, reshaped it, destroyed the oppression of the British Empire, ensured the evil of slavery would be destroyed–despite the brutal cost–freed Europe twice, saved millions from genocide, reshaped the Free World and held the line against religious extremism that threatens it. To wear the flag means you are a game-changer. Every generation’s men and women in uniform have made a difference from Lexington Green to the Qalats of rural Afghanistan. This day is for all of you with the courage to serve and fight. Digby in the woods during a rare break in his woodland critter spree killing. My apologies for being absent from this page for these past few months. 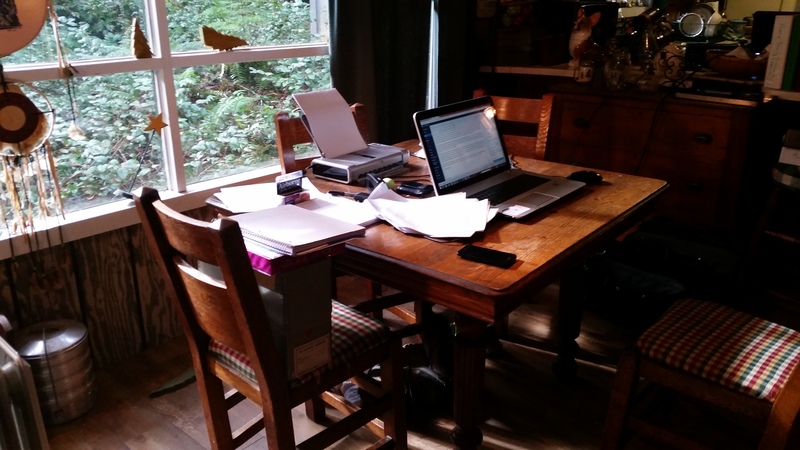 Gwen and Digby (another foundling cat) have been up in the Oregon mountains with me as I’ve separated myself from daily life to get the Indestructible manuscript finished. Frankly, it got pretty lonely up there in the Cascades away from the family. At times I went two weeks without seeing anyone besides the clerk at the nearest market four miles away. The last month up there is all sort of a blur, but I do believe I began to talk to the trees and at some point befriended a mouse that kept getting into the cabin to eat my English muffins. At one point, he ate half a tomato sitting on the kitchen counter while I was in the shower and Digby the cat sacked out on the couch. That level of brazen had to be rewarded, so I began feeding him too. Digby and DeShawn (the mouse) entered into some sort of unholy domestic-woodland creature alliance that ensured there would be no bloodshed between them. The family came up with Ryder for a weekend. I wanted to sing Some Enchanted Evening when Ryder and Gwen spotted each other for the first time in a week. (Ryder is the blur at the bottom left). 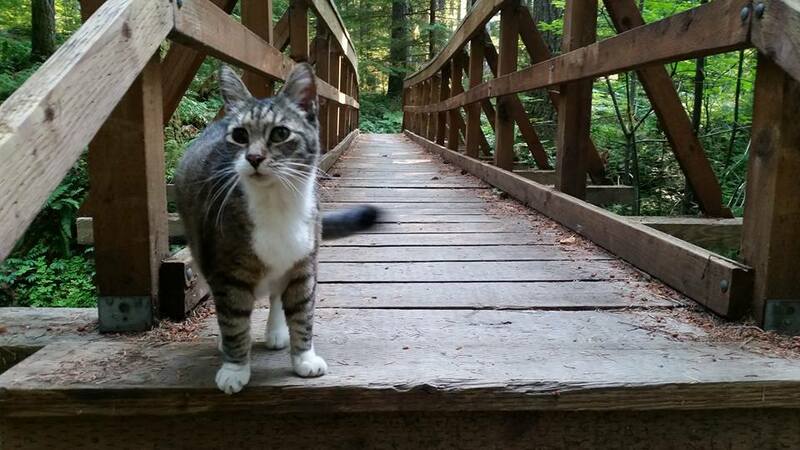 When at home in the Willamette Valley, Digby is a lazy, dump truck sized cat with a big waddle of fat that slops from side to side on those rare moments where he engages in any sort of cardio exercise. See the video below for his inspiring mellowness. If he were a person, he’d be that 25 year old kid playing Xbox all day in his grandma’s basement eating funions and drinking Mountain Dew. 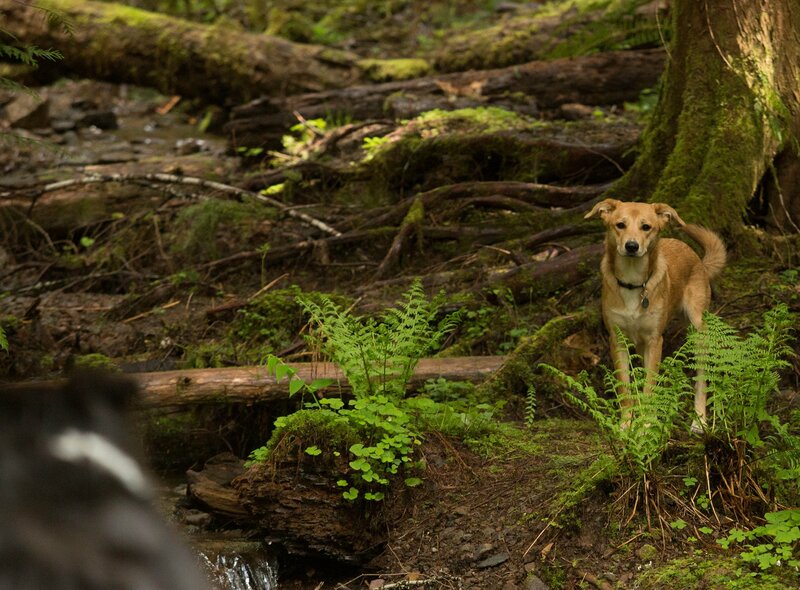 Passive, perpetually happy and mild mannered, Digby turned into a murderous beclawed machine of death when I took him up into the Cascades with me. Seriously, I thought I brought a furry lump with which to decorate the couch. Instead, I unleashed a spree killer on the local woodland creatures. He’d go outside, and within minutes, voles, mice, rats, chipmonks and even a salamander ended up victimized. So I ended up living for a month with the feline version of Hannibal Lechter, yet he never ate DeShawn–the one creature inside the cabin. Gwen hung out with me at times up there too, but our now-full grown Jordanian refugee spent her time in the woods pining for Ryder, our Aussie Shepherd. As much as she is my dog, her heart belongs to the Aussie. While I wrote, she would pace restlessly around the cabin, occasionally howling as she looked around for Ryder and wondered why anyone could be so cruel as to separate her from her pack. Long walks and runs to the lake didn’t seem to calm her down. At one point, she decided to eat some of my secondary sources including a volume of Cate & Craven’s history of the USAAF during WWII. I draw the line at chewing up books, so Gwen went back to the valley and Digby stayed with me to ensure the enforced solitude would not cause long-term insanity. 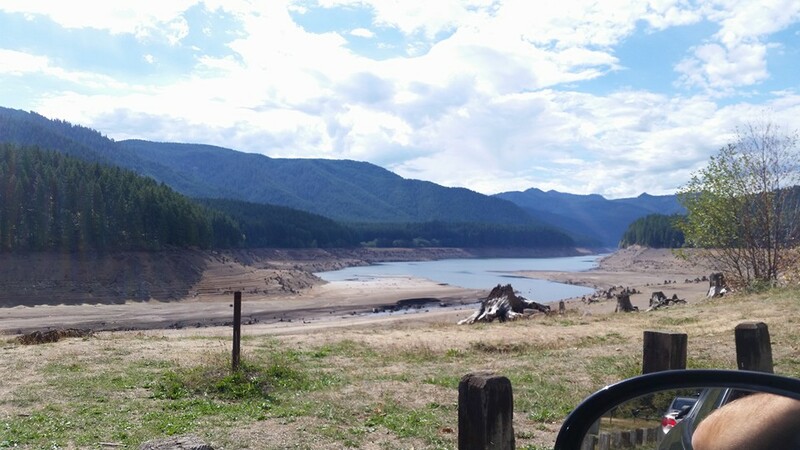 Thanks to the drought, not much water in the lake this summer. Anyhoo, once I finished Indestructible, I came out of isolation and have been enjoying some much needed family time. My daughter Renee is a senior in high school now, and I am determined to see as much of her final year as I can. Ed is a freshman, just had his first slow dance, and is in the school’s fall musical. So, I’ve been spending my time photographing their fall term and taking lots of walks with Ryder and Gwen. 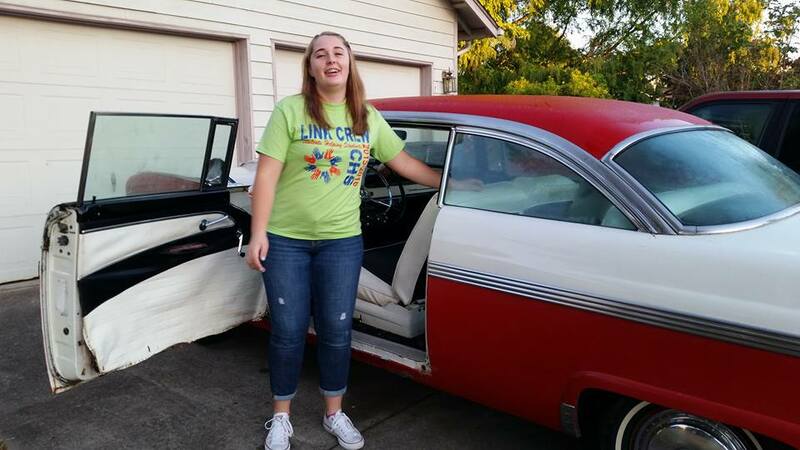 Renee’s first day of senior year with her new ride, which was my first ride. Anyone know what it is?? 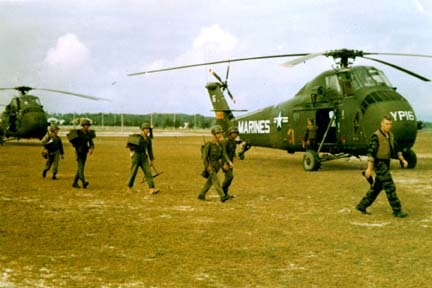 I’m back to it now, and in the coming weeks, we’ll have some unusual stories to share here, including an update on the Last Lost Letter, a story about a legendary Marine’s shower shoes, and how they went from Guadalcanal to Tarawa with two different great American warriors. We’ll also have more stories to share from the Japanese side of the Pacific War and some fantastic photographs from the Korean War So stay tuned, and happy Fall to all of you! Ed and I on prom night last spring, right before I went into the woods for the first major writing session for Indestructible. Warriors of the Homeland. 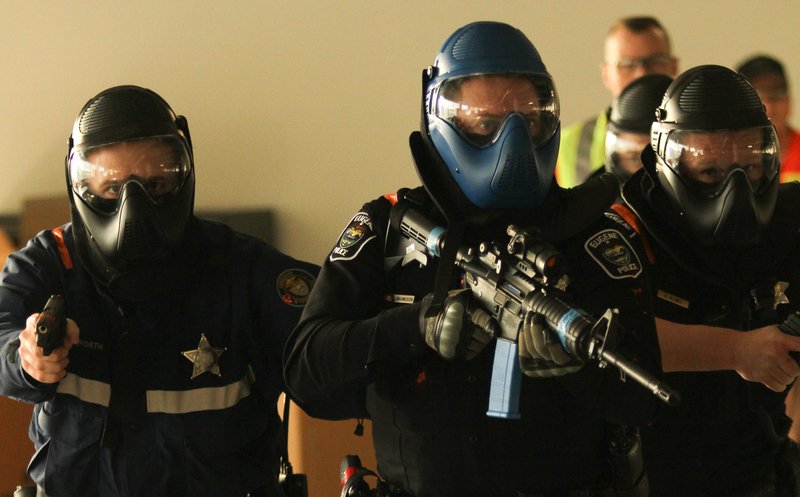 Eugene Police Department training in an active shooter exercise. 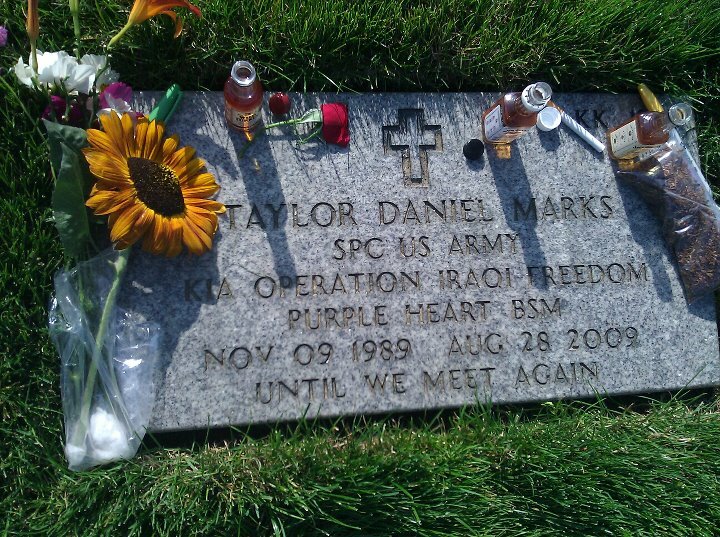 In August 2009, Specialist Taylor Marks was killed by an Iranian-made EFP roadside bomb emplaced on a bridge in downtown Baghdad only a short distance away from an Iraqi Police checkpoint. 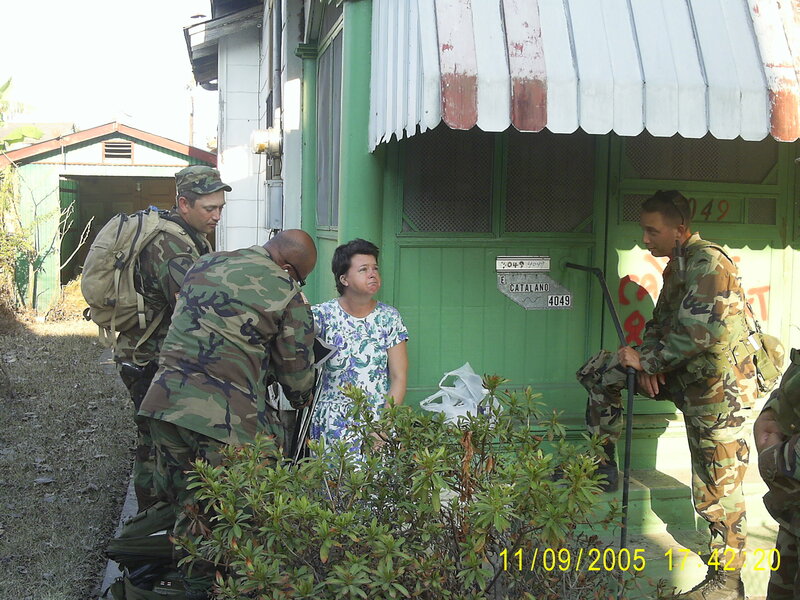 Killed with him was Sergeant Earl Werner, a veteran of OIF II and the Oregon National Guard’s relief efforts in New Orleans following Katrina. I did not know Sergeant Werner, but I knew of him. Taylor, on the other hand, was like family to me. 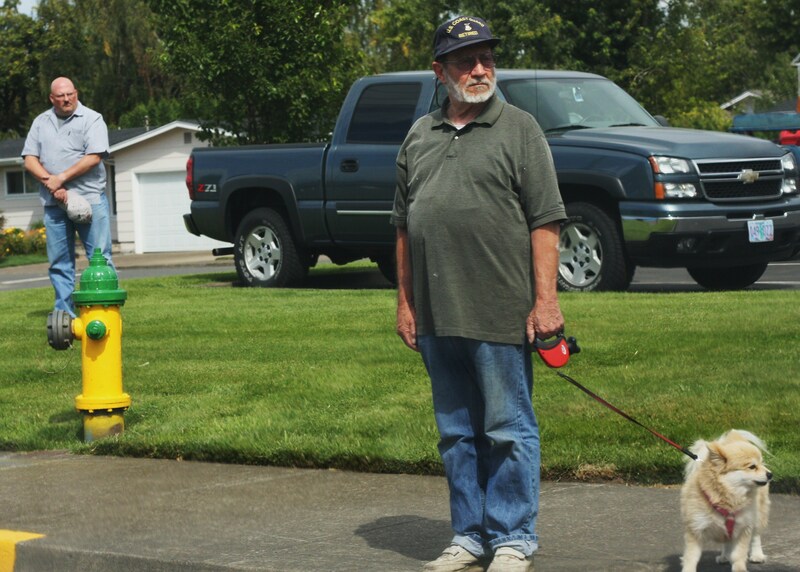 Before he left our little Oregon town, he had routinely babysat my kids. He introduced my son to LEGO’s and showed them you could set stuff on fire with a magnifying lens and some sunlight. That was the Puckish side of him–he liked to push boundaries, but never so far that he got out of line. His teen age rebellion consisted of exploring abandoned buildings at night, playing with fireworks, and building modified potato guns that could fire simulated RPG’s at 2-162 Infantry’s Humvees during drill weekends. 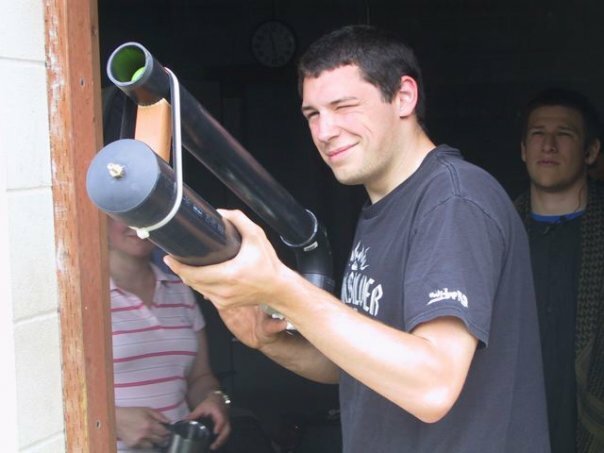 Taylor armed with one of his RPG simulators at Fort Lewis in June 2008, his last volunteer OPFOR drill weekend before leaving for Basic Training. He was a brilliant young man who had earned a scholarship to the University of Oregon, where he planned to become an Asian Studies major. But after meeting me and my band of rag-tag civilians who role-played bad guys for the Guard and law enforcement, Taylor chose a path of service. He joined the Guard straight out of high school and was training to be a military intelligence specialist when the 41st Brigade departed Oregon for its pre-deployment work up at Camp Shelby in the spring of 2009. Taylor originally had orders to attend the Defense Language Institute in Monterey, California, but the 41st was so short handed those were changed at the last minute. 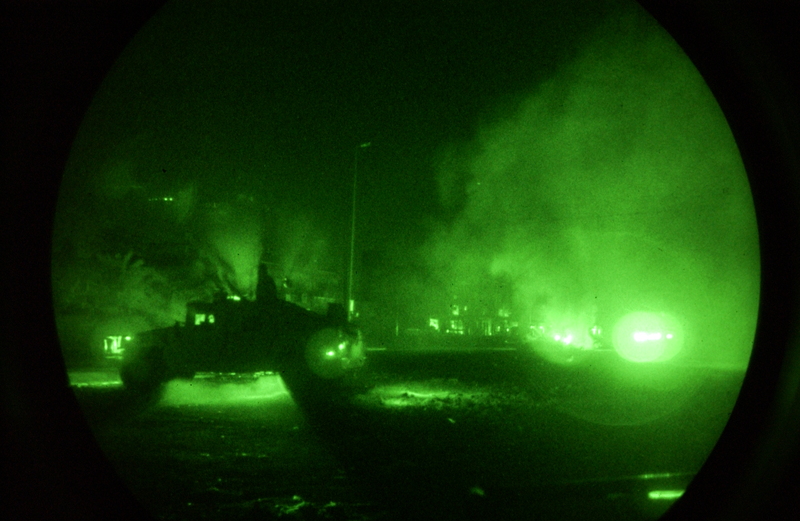 Instead, he was pulled into the 82nd Cav and assigned to be an MRAP driver. 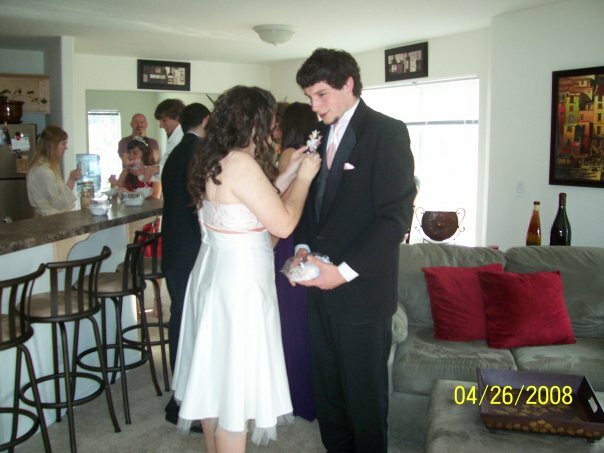 Taylor’s senior prom night. I let him have my Pontiac GTO for the night. 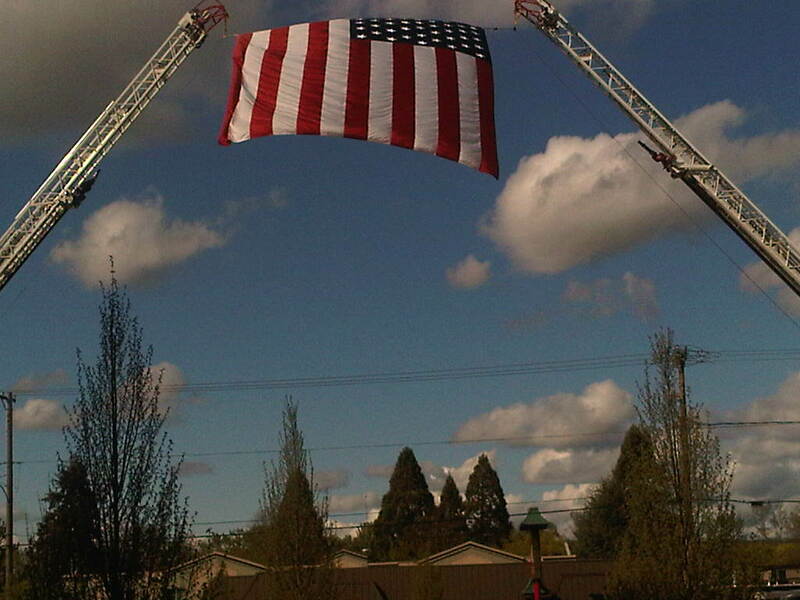 He’s one of about six people to have driven the car, and it escorted his remains home from the airport, then to Willamette National in 2009. The GTO will never leave my family as a result. 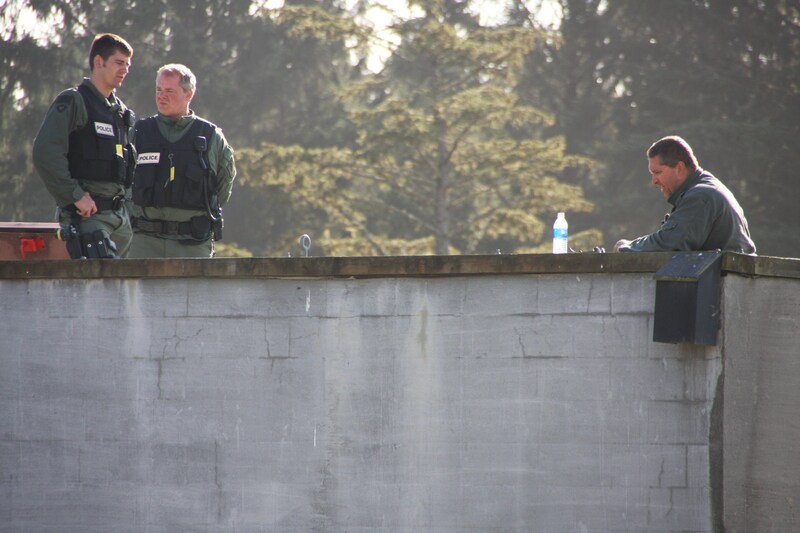 He reached Oregon in early June of 2009 having not fired a weapon in months. During one of our OPFOR drill weekends at Camp Rilea, Oregon, I asked some of the NCO’s there if they could get Taylor some range time since he’d missed almost all the pre-deployment training with his new unit. About two weeks later, Taylor was sent to Camp Shelby just in time to help his unit pack up and head out the door for Iraq. 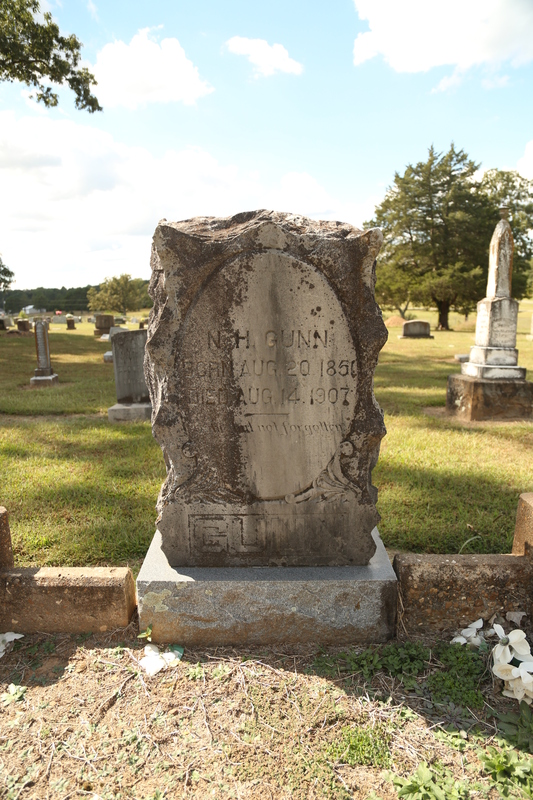 He was killed in action six weeks later. The 973rd Civlians on the Battlefield (COB). Taylor is standing at top right. His death in combat was one of those terrible turning points in my life. I lost a young man who’d become a major part of my family’s life, whose life had been set on the path to Iraq by his association with me. Intellectually, I knew his death was not my fault. But in my heart I knew that had I not drawn him into my group of civilian volunteers and introduced him to the National Guard, he’d have gone off to college like so many other young men. My heart will always be burdened with that guilt, and it took me almost five years to reconcile and accept that burden of responsibility. I also learned that the pain of loss never goes away; it just becomes a part of you that either you accept and live with, or it will torment and destroy you. It was a toss up which way it would go with me for a long time. Part of me went to Afghanistan to tempt Fate. If God wanted to take Taylor, then take me too. He didn’t. I came home, and Taylor didn’t, and for a long time that made his loss even harder to bear. It colored every day, and for a long time, it took down much of the best parts of my life. In my eulogy of him, I promised to live my life for him, as adventurous and wide open as he had led his. I took that vow as sacred, and have tried to live up to it, but there were times in the first years after his death that I very nearly gave in to the grief and guilt. 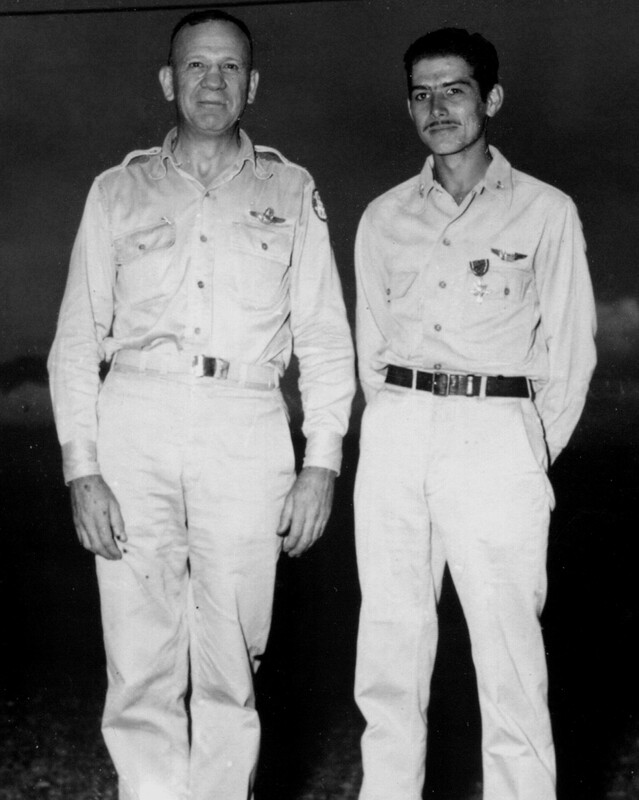 Gerald Johnson (at right). MIA October 7, 1945. He was lost in a typhoon off the coast of Japan less than a week before he was supposed to rotate home. 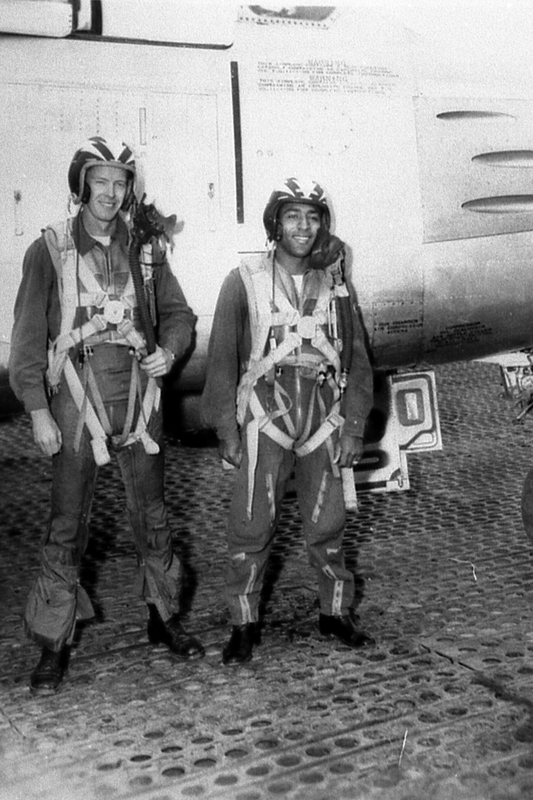 He’d survived over 1200 combat hours and 265 missions in three tours that spanned the Aleutians, New Guinea and the Philippines. 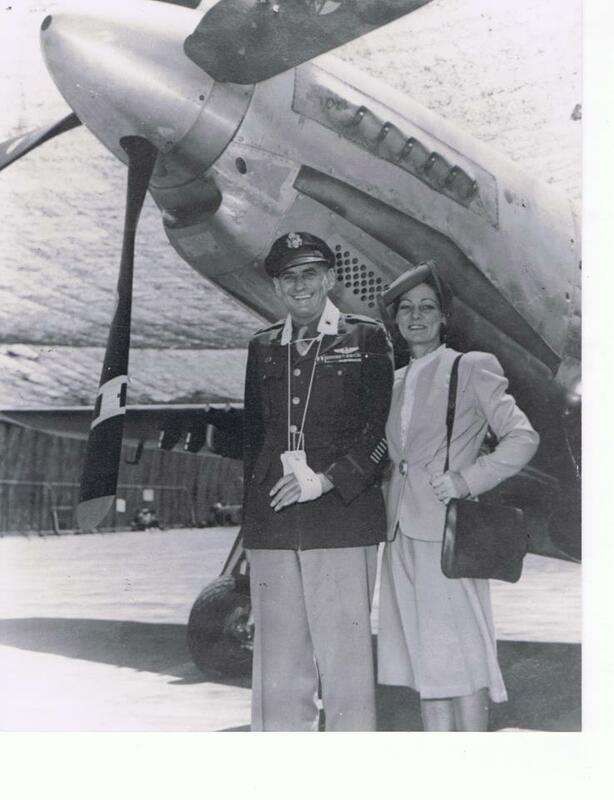 In the 1990’s, I became very close to 49th Fighter Group ace Colonel Gerald R. Johnson’s widow, Barbara. Like Taylor, she had become part of my extended family, and had even been part of my wedding party in 1993. While writing first my M/A thesis on her beloved husband, then the book Jungle Ace, my time with her was precious and life-changing. It was also the first time I really began to understand the magnitude of such a loss. Five decades had passed since she had lost Gerald at war’s end, but his death had altered the landscape of her life so profoundly she lived in its shadow for the rest of her life. The grief never went away. Time does not heal all wounds. In Barbara’s case, it perhaps dulled the pain a little bit, but it was always there in her eyes. So this Memorial Day, there will be countless pundits speaking of the “ultimate sacrifice” and the bravery of our warrior heroes. Sacrifice will be so overused that it will lose its meaning. For me, Memorial Day has become a reminder of pain, of my own experience with loss, of the pain I saw in Barbara’s eyes and so many others whom I’ve met over the years who lost a beloved family member to war and violence. I will remember the elderly neighbor we had when we first came to Independence. She lived alone and was very isolated from the community. When I came to her door canvassing for a political cause, she welcomed me inside and we talked for quite a long time. She had married young, during WWII, to her high school sweetheart. Before he left for overseas service, they had a daughter together. He was killed in action, and she never remarried. What was the point, she had said to me. Her Love had died. She focused on raising her daughter and lived the rest of her life in quiet loneliness, waiting to be reunited with her Soldier. I am typing these words right now in the Saratoga Public Library in Saratoga, California. 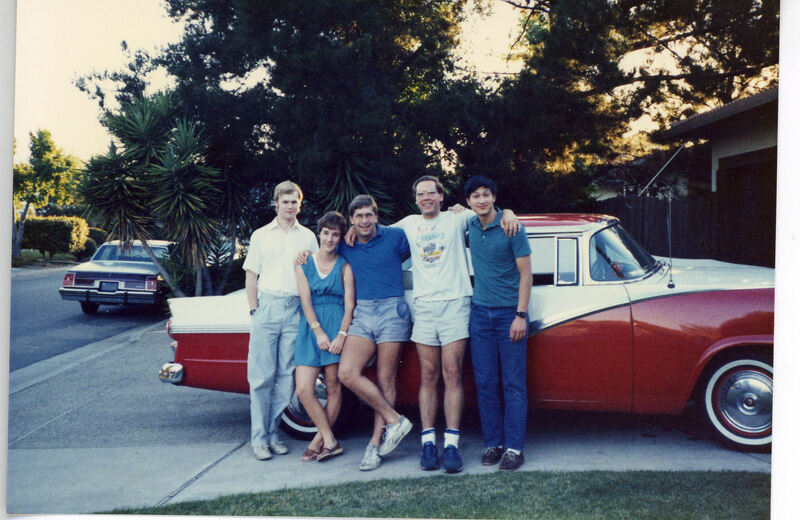 I grew up here in the heart of the Silicon Valley back in the 70’s and early 80’s. This library was my refuge, and it was here that my love of history and writing took hold and flourished. I spent countless hours after school here, reading everything the library had collected on World War II, lost in the romance and adventure of air battles, aces and the nobility of service. I look back now and realize that I never understood the reality of combat and what that does to the human soul. It took losing Taylor and seeing the fighting in Afghanistan for me to catch a clue and glimpse that reality. Now I understand that the death of a warrior is not only the end of a life and the destruction of so much potential, but the turning point in every life close to the lost Soldier’s. That death will have a cascading effect on those left behind that is rarely discussed or understood. For the Johnson family, Gerald’s death led to such anguish that his twin brother Harold ultimately took his own life. The shock of that led to his father’s death only a few weeks later. For me, it was the end of what I call my old life and so much in it that I loved. My sense of family changed forever, I lost friends and relationships. Like so many others, the death of an American warrior redrew the fabric of life back home. The ripples of loss spread across families, neighborhoods, communities. One by one, they redraw the face of America until, by war’s end, we find ourselves a changed nation. When I think of Taylor now, I think of all that our nation lost when that EFP took his life. Had he lived, what amazing things he could have done with his mind and talent. The way he could have added to our collective experience, the way he would have found meaning in his life surely would have led to the betterment of the world in some small but notable way. His was one of thousands of lives cut short since the towers fell, one drop in an ocean of lost potential torn from us by an enemy who would strike at our children and our own homes if given a chance. Devoted men and women who believe in our nation’s exceptionalism and have the courage of their convictions to stand strong in the maelstrom of combat are among America’s most valuable souls. 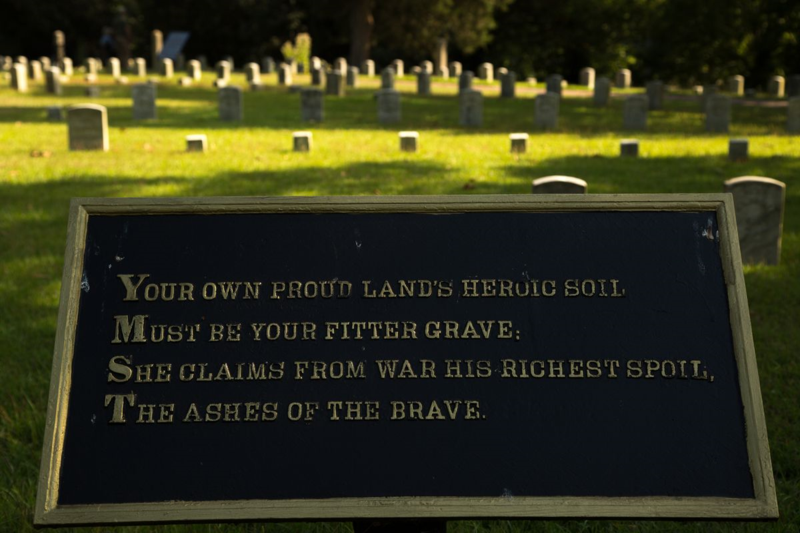 On this Memorial Day, as we mourn for those we lost, let us hope our nation’s leaders remember their value and pledge to ensure that when they are called to battle again in the future, the cause is the measure of their commitment. To all of you hurting on this Memorial Day Weekend, all I can say is don’t lose the Faith. If you do, our nation is lost. 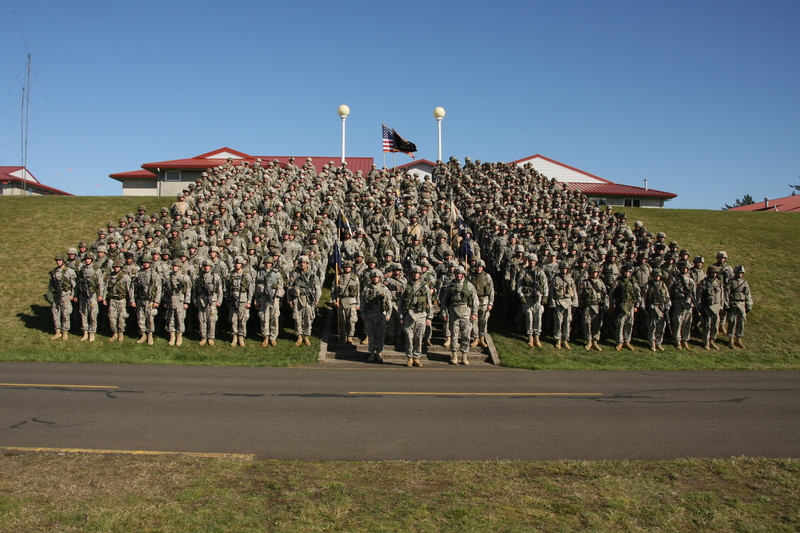 2nd Battalion, 162nd Infantry, Oregon National Guard. Camp Rilea, October 2008. Mobilization Day for the unit’s second deployment to Iraq. Below is the eulogy I gave at Specialist Taylor Marks’ memorial service in Independence, Oregon in September 2009. Over a century ago, Walt Whitman wrote of his experiences in the Civil War, and its aftermath. With pure deliberate notes spreading, filling the night. And I with my comrades, there in the night. Borne through the smoke of the battles and pierc’d with missiles, I saw them. They themselves were fully at rest, they suffer’d not. And the armies that remain suffer’d. 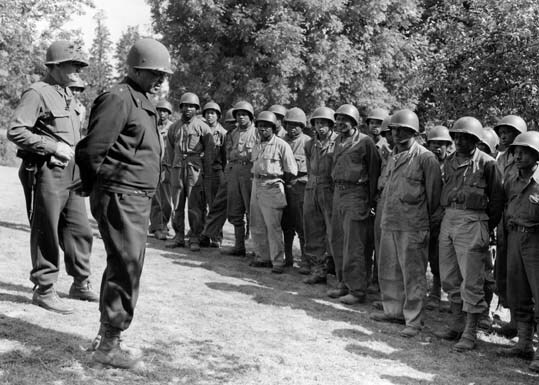 Taylor Marks made the transition from boy to man, first by training soldiers, then by joining them in battle. 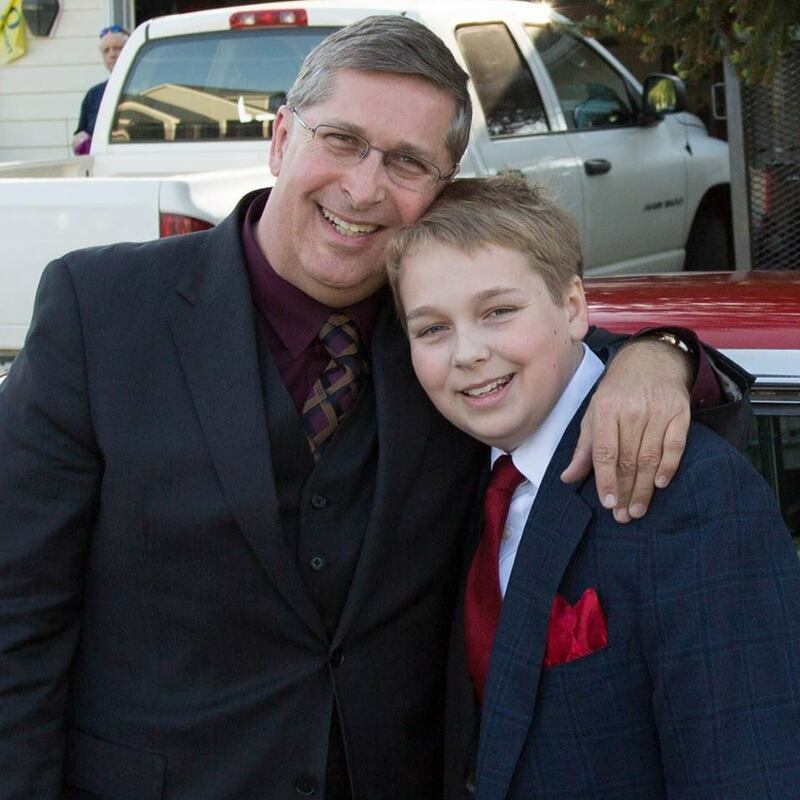 During this cornerstone period in his young life, I had the singular joy, pride and kinship to be touched by Taylor’s bright and dawning spirit. Winston Churchill, not the statesman, but the American novelist, wrote about how disorienting this voyage from child to man can be. At all events, when I look back upon the boy I was, I see the beginnings of a real person who fades little by little as manhood arrives and advances, until suddenly I am aware that a stranger has taken his place. No stranger ever took Taylor’s place. To his last breath, he remained gentle of heart, loyal to those he loved, faithful to our Lord, and true to the values he had established long ago, thanks to the guidance of his family. He never lost his idealism. His spirit was never tarnished with bitterness or regret. He loved the Guard and his blossoming role within it. Unlike Churchill’s character, he negotiated the path to adulthood not to look into a mirror and see a stranger, but to see the eyes of the man he wanted to become. What a gift. So few of us get there, especially so fast, that I found myself in awe of Taylor. Two things brought Taylor and I together: a Christmas card and a ballroom dance class. These two disparate moments in our lives formed the nucleus of our bond. In the months that followed, it was solidified and nurtured through shared misery and the sheer uniqueness of our common goals. In December of 2007, I was sitting on my couch. 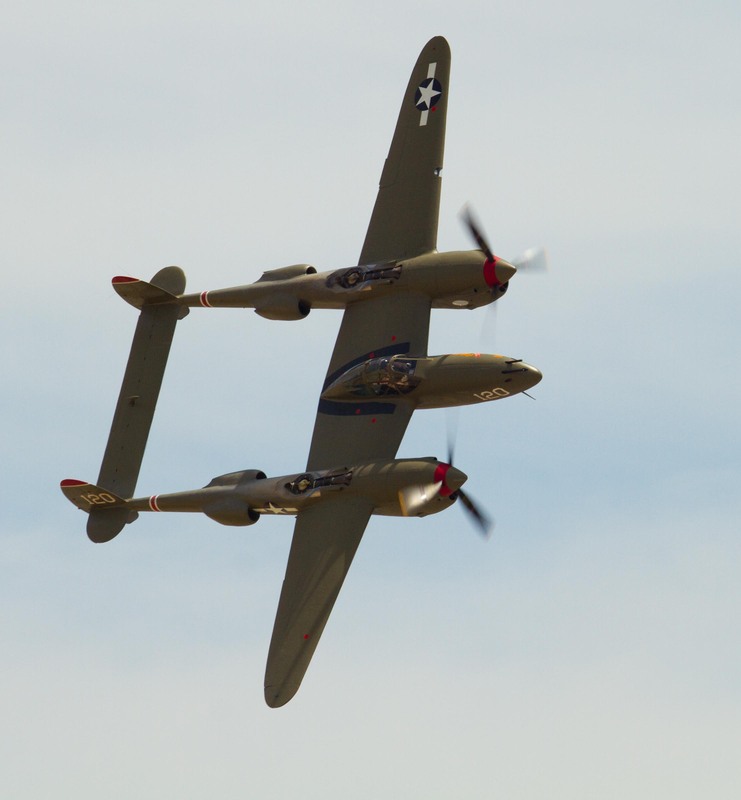 My then six year old boy, Eddie, was nestled next to me, babbling on about all the World War II airplanes he wanted for Christmas. My wife Jennifer, handed me a beige envelope. It was a Christmas card from Ken Leisten Sr. Kenny, his son, was killed on July 28, 2004 in the Sunni Triangle. I wrote about him in The Devil’s Sandbox, and every July, I go to Willamette National to be with Vince Jacques and the rest of Kenny’s platoon to celebrate his life. I sat and read this card from a man who had lost his only son, while my only son’s arms were tight around me. I started to cry, partly for Ken’s loss, but also for my own utter selfishness. What had I done to see that no other father loses his boy? I had reams of tactical information on the enemy from the books I’d researched and written. Time had come to put it to use. The previous May, Brad Bakke, Aaron Allen and I had role played insurgents during an Alpha Company, 2-162 Infantry drill weekend. Being an insurgent was brutal. I was sick for a month afterward. Alpha Company asked us back for the January drill. I said I’d be there with a group ready to be abused. At the time, I’d been asked to teach a ballroom dance section in a PE class at Central High. Most of the kids weren’t really all that into learning how to swing and waltz, but I noticed one kid had game. Every period, he came eager to learn, willing to give something new a try, and seemed devoid of self-consciousness and immune to the vibe sent out by his peers that this just wasn’t cool. That was Taylor. He had these absolutely bizarre sideburns and chin fuzz that made me wonder if he’d taken the pilgrim section in his history class a little too seriously. But that could be, and later was, shaved. What moved me about this kid were his eyes—dark and wide, they radiated curiosity. 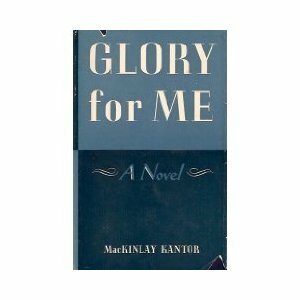 They had depth and a sort of grace found only in much older men totally at peace with themselves. I saw in their depth, keen intelligence and a thirst to explore the world. I didn’t see selfishness. I didn’t see a sense of entitlement. I didn’t see a kid who’d succumbed to pop culture’s fixation on the superficial or the material. And I also sensed a bit of Puckishness in him. I liked that. I liked that a lot. Just before Christmas vacation, I assembled the class and told them I was forming a group dedicated to helping train 2-162 Infantry for its next combat deployment overseas. I told them we would be roughed up, we’d be working in all manner of weather conditions, and we would be taxed to the utmost of our endurance. I didn’t sugarcoat this. I made it clear it would be a challenge, but one with tremendous rewards. Our goal: prepare those who fight so that every one of them comes home to their families. Taylor was all over this. He wanted in, and was willing to bring friends. I checked with my wife, who had Taylor in her math class, and she gave me the thumbs up. Outstanding kid, good grades, sense of responsibility. He would not goof off. Taylor brought Gaelen Bradley into our group. As the January drill approached, we wanted to make a statement to the Oregon Guard that we would not be your average weekend enemy force, or OPFOR. I scheduled us to support two companies: Alpha down in Eugene, and Charlie at Camp Whithycombe up in Clackamas. To pull this off, we’d need to go all weekend with minimal sleep. That Saturday rolled around, and I kept Taylor and Gaelen close to me in the shoot house at Goshen. Each fire team through the door had to make a split-second decision based on our reactions to them: greet us as friends, detain us as suspects, or shoot us as hostile insurgents. When Sergeant Alan Ezelle first told us to be hostile and resist detention, I watched Taylor get slammed face-down into concrete and broken glass. After that iteration, I thought he’d be done. He got up grinning. Gave me a thumbs up and grabbed one of our training AK-47’s, and made ready to give the next fire team. And so it went. Fire team after fire team. Squad after squad. Taylor was dumped, dragged, shot at with blanks at close range, and generally pummeled into submission. Sergeant Ezelle didn’t make us friendly local nationals that often, so we did a lot of fighting in the snow that day. We learned one of the nuances of being an enemy force in training: you’ve got to bring the appropriate level of violence to each squad based on their level of experience and ability. As they learned and got better, Sergeant Ezelle had us ratchet up our resistance. When the day ended, Soldiers came to us and thanked us. “You’re the most realistic OPFOR we’ve ever had.” Others said, “That’s the best training weekend I’ve had since joining the Guard.” We would hear that a lot in the months that followed, and every time such words served as rocket fuel to our motivation. That evening, sore, stiff and soaking wet, we climbed into our cars and drove home, changed, then sped to Withycombe in time to dig shallow firing positions and execute night ambushes on Charlie Company. We finished at 3:30 that morning. Taylor was still grinning. By the end of the weekend, our group had put in 37 hours and had impressed 2-162 enough to give us civilians a role at every field drill. Taylor and Gaelen, and Bethany Jones and Shaun Phillips set the standard for our group. We incorporated as a non-profit called the 973rd COB—Civilians on the Battlefield. In the months to come, we spent out of our own pockets tens of thousands of dollars on equipment, clothing, and training devices. SimplyIslam.com must have wondered if a Mosque had opened up in Polk County after all the orders we placed for Arabic clothing. My office is so heaped with training AK-47’s, RPK’s, and other gear that it has become known as the Unawriter’s Lair. When Taylor saw Alpha Company had limited access to training IED’s, he and Shaun Phillips went to work. They built simulated car bombs that when detonated, touched off a siren. When nine soldiers were killed or wounded entering an Al Qaida safe house in Iraq in early 2008, I got word from a friend over there that the place had been wired with an IR-triggered bomb that went off when the door was breached. Taylor and Shaun constructed a duplicate, and we employed this tactic against Alpha Company so they could develop counters to it. When we started ambushing Humvee convoys at Rilea, we didn’t have access to simulated rocket propelled grenade launchers. The dreaded RPG’s. Taylor went off and built two. I’ll never forget the first time we tested one of them. We were down at Riverview Park. We wanted a projectile that would travel far enough to be useful and make a loud enough noise on impact to let the Soldiers in the Humvees know they’d been hit. At the same time, we didn’t want to use anything that could cause an injury. That is an engineering challenge way beyond me. Taylor came up with miniature nerf footballs as ammo, squished and wrapped in duct tape. I was skeptical, and dared him to hit my GTO from about 200 feet. I got in and drove it at a steady clip, and he let loose on me. THUNK! The Goat shuddered so hard I thought the whole right side had been bashed in. Taylor had hit the Pontiac’s real quarter panel. That was the last time we used my muscle car for target practice. Taylor’s stuff worked, and it worked in the field because he designed them to be rugged. He paid for all the materials out of his own pocket, with money that he earned from his job at the Chevron station on 22. Every drill weekend, Taylor was there, setting a quiet example with his relentless work ethic. As he came to understand the Soldiers and what they would face in the months to come, he grew ever more dedicated. At Rilea, and at Goshen, we didn’t leave the field until the last Soldier had come off the lanes. Taylor was almost always the last man off with me. He came to respect, then revere the NCO’s who worked with us. Sergeant Ezelle, Sergeant Hambright, Sergeant Cochran—they became Taylor’s role models. He saw in them a willingness to confront evil on distant shores. He saw in them the consummate professional NCO—capable teachers, disciplined human beings, and men capable of telling a story or two about their wild days. Taylor asked me to be one of his mentors on his senior project, which he produced on our group. I was honored, and he’d come over to my office and we’d have some pretty serious heart to heart talks. He’d received a scholarship to the U of O and had been set on a course much like mine at his age: college, dorm life, the intellectual challenge of academia. But he found his true calling with us. 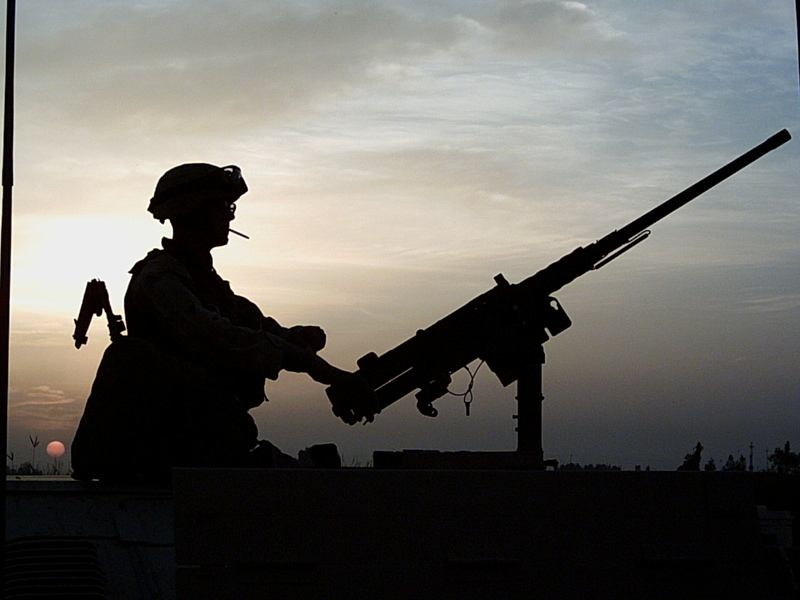 The combat arms of the U.S. military represents one tenth of one percent of our population. The fate of nations—our nation—rests on so precious few who are willing to bear this burden and forgo the advantages of an average civilian life. As he saw the commitment 2-162’s men shared, he felt it grow within him. Once, at Andy’s, he wondered out loud how he could go to college when something so much larger needed good young men. When he defended his senior project, I sat in the back of the classroom and felt like the proudest parent in the world. He nailed it, too, by the way. That spring, the 973rd assembled the most outrageous and diverse group of individuals I’ve ever been associated with. Everyone understood the importance of the mission and took our responsibility in every field exercise very seriously. But along the way, the unexpected happened. We went from strangers to family in a drill weekend. I always wanted an extended family. My own back in California is a mess, and I always sort of felt alone and left out of something most others share. The 973rd became my crazy, boisterous, clan, bonded by the oddity of our undertaking, and the scores of hours spent in the bushes with each other waiting to ambush the next patrol. Taylor became a brother, a son. So did all our young men—Spencer, Joe, Andrew, Aaron, Gaelen—just to name a few. Joey became our spiritual center—irreverent yes, but a shoulder and an ear for everyone—including Taylor. Mark Farley our XO, balanced us, kept the peace when things got rough. I was the leader, always demanding that we be better than perfect on every iteration. And Jones too care of us all. One day, that spring, Taylor asked me to hook him up with a recruiter I trusted. I gave him a copy of the Devil’s Sandbox and told him to read it. He came back, more resolved than ever. I wanted him to know—to understand what was at stake and the perils of the warrior profession. I gave him House to House. He read it and badgered me some more. I was too slow for him. He went and got a recruiter on his own. Sergeant Ben Taylor played it absolutely straight with Taylor. But I completely freaked out. In front of my kids, I called Ben and tore into him and screamed things to him I’ve never said to another human being. I was protecting my cub. I later sat down with Ben and his boss, Colonel Myer, and found that my preconceptions were all wrong. 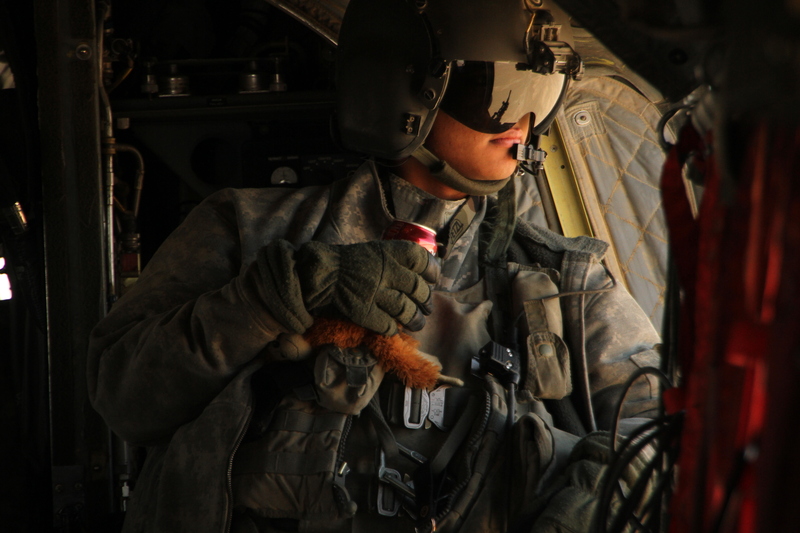 Ben is a compassionate, dedicated member of the Oregon Guard, and he came to love Taylor as much as the rest of us. Ben is one of the most honest and straight human beings I’ve ever known. After Taylor scored a 98 out of 99 on the ASVAB, he found a way for Taylor to use his love of language and Asian culture for the benefit of the Guard. He was set to go become an interrogator and a linguist, with Cantonese and Japanese as his specialties. Ben’s stewardship sent Taylor’s morale through the roof. School was coming to an end, and I wanted Taylor’s final weeks to be memorable. That spring, during an Alpha Company drill at Goshen, he dragged his white sedan down to the range to be used as an obstacle the Soldiers would have to search. What kind of a high school kid offers up his wheels for a training exercise? I never would have been so gracious. The car took a beating, and Taylor never once complained. To honor that, I let him borrow my GTO so he and Gaelen could double date to the Senior Prom. Aside from my wife, who keeps breaking it, Taylor was the only other person to drive this car. That Pontiac means a lot to me. It was the first totally frivolous thing I’d ever purchased in my adult life. Up until recently, we never had the resources to be frivolous, we were lucky to keep our house. My wife had faith that I could make it to New York as a writer—and she was the only one who kept that faith—and the GTO became my reminder of our shared success. Taylor treated my Goat with reverence. I gave him the keys, told him to keep it under eighty—yeah right—and have fun. Later that night, I grabbed the family and piled into our other Pontiac. “Where are we going?” Jenn asked. “Gonna check on the Goat.” I said. That was the first time I’d ever been in the Green Villa Barn’s parking lot. The senior prom was held here. A year later, we’ve returned to the location of one his best high school memories to honor what he has meant to us. Now, we are left to grieve. Thank God I don’t have to do that alone. The 973rd gathered Friday night to share this trauma equally. We visited Taylor’s family, and Michelle, Don, Morrey and Courtney—with your grace and gentle spirits you gave us the greatest gift one human can bestow on another: the ability to heal from this loss. Had we not come together as we had, had I not felt the warmth of your embrace and heard the things Taylor said of me from your own voices, I would have been done. The guilt, the pain—it would have been too much. Instead, your open home, and your open hearts laid cornerstone for a new beginning for all of us. You also gained my extended family, my clan. Courtney, you now have a big sister in Jones and twenty older brothers. If your boyfriend breaks up with you, call us. We’ll go beat him up. This connection will bind us forever. That connection began Taylor became one of our own. He babysat my little boy and little girl. He taught them to melt stuff with a magnifying glass, and now I have two pyromaniacs who go nuts on the 4th of July. That’s okay, so do I. He showed them how to use my treadmill for things other than exercise. One day, he brought a big tub full of Legos over to my office. We’d never given Eddie Legos before, which Taylor thought was appalling. So he gave my boy his childhood collection. Overnight, Eddie went from a WWII airplane fanatic to a Lego-obsessed construction foreman. My office became a cityscape, complete with sharks eating Indiana Jones and elaborate space ships docked on my furniture. Just walking around without puncturing a foot on these things became a challenge. A year and a half later, Eddie’s urge for Legos has only grown. That’s all he wants for birthdays and Christmas now, and we’ve grown Taylor’s original collection significantly, partly because one of my other adopted sons, Andrew Bowder, contributed his childhood sets to the cause as well. Someday, I hope Eddie’s son will play with them, too. Grandpa’s job will be to tell him about Taylor. 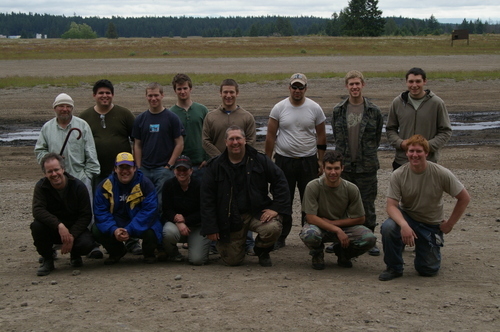 We spent a year with the 2-162 and participated in every field exercise here in Oregon as they prepared to go to Iraq. We learned how to test each squad. We exploited mistakes so we could impart lessons. We figured out gaps in fields of fire and helped each squad hone their skills so such errors were ironed out here, where it didn’t count, instead of learning them with casualties on the battlefield. We earned the respect of every Soldier who went through our lanes. About two weeks ago, I heard from Sergeant Ezelle. He’s in Iraq now, and I asked him if our group really made a contribution, and what we could do to improve for the next unit we help train. Easy wrote back, “You helped my men more than your group will ever know. Thank you.” From a two deployment veteran, that meant everything. He also added, “You need to start charging the Guard.” Never. We will never take a dime. 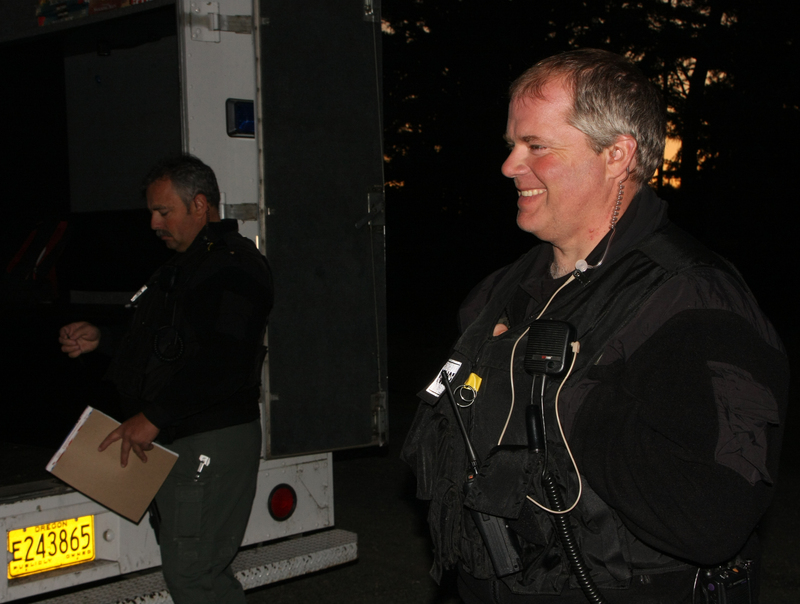 We now support other elements of the Guard, as well as the state police, local law enforcement and SWAT Teams. What Taylor helped found has grown beyond all our expectations. 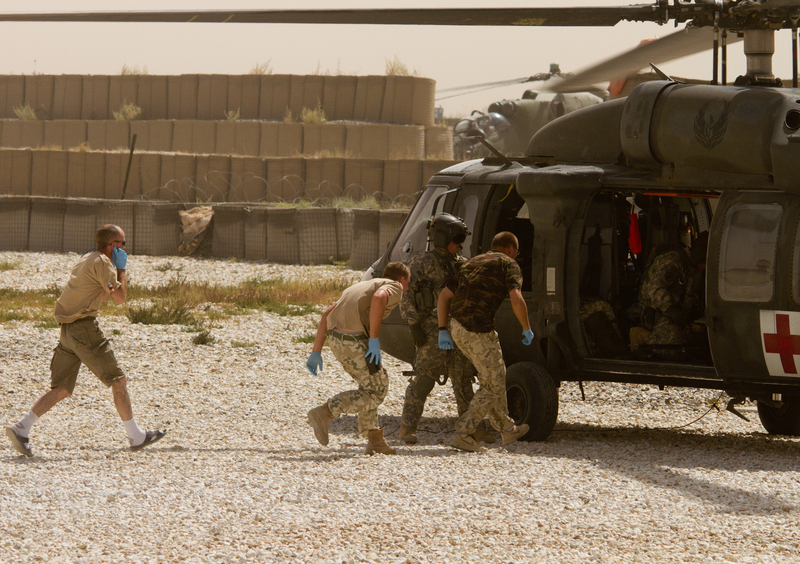 And we stand ready to help prepare those who fight anytime, anywhere. Forming and leading the 973rd has been the most meaningful experience of my life. If we helped to save one Soldier’s life, there is nothing greater any of us will ever accomplish. From our group, four of our young men—my adopted sons—have either joined the military, or are in the process. I live in fear of another day like this one, but at the same time I am so proud. They saw what Taylor did when we worked alongside the men of 2-162. As Taylor prepared to leave, we sat down for lunch at Andy’s again. I told him that he stood on the threshold of his life. The pages ahead were unwritten—he just needed to write the story. Seize, it. Go be great. Don’t lie down and succumb to the mediocrity of a life half-lived. No worries there. Taylor was already headed that way. He was a special man, with talent, potential and drive to lead him anywhere he wanted to go. And one thing for sure, he was destined for a significant life. Where he wanted to go was into the fight, to be a member of that one tenth of one percent that keeps us safe and fights to liberate the world of all its evils. He offered his life—he didn’t give it. It was taken away by evil so vile it has scorched us all. He lived far more in his nineteen short years than most of us will in eighty. He did so with the same wide open heart that we found in his family. His pages will remain unwritten. And I’ve been wondering how I will survive that. Let his spirit be our guide. Taylor went into life wide open to it. He reveled in a challenge, chased dreams and flung himself into whatever task absorbed him. There’s nothing ordinary about that. I will live. And I will go into every day with Taylor never far from my mind. I will match his zest and daring, and I am not going to sink into the mundane. This life we all continue to share—Taylor has shown us just how precious and fleeting it is. We don’t know how many pages we have left to write in our own stories. We have to treat each one as a miracle. So, I will challenge all of you today, rise to this occasion, take with you Taylor’s spirit, and sally forth into the world with his unbeatable optimism and sense of adventure. Let it carry you to new places, let it lead you to new relationships, and may you be always be open to the wonder and beauty of this extraordinary planet. Don’t let your job or career define you, and force you into a workaday rut that never allows for the majesty of a sunset shared with one you love. Instead, take the road less traveled, the one Taylor chose. He refused to let the world define him. He stayed true to his childhood identity even as he came to manhood. That takes a powerful, unique spirit, and it is a soul to emulate. The successes I will have in the future, will be Taylor’s as well. He will spur me on when I’m fatigued. He will nudge me when I fall in a rut. I will dare when once I would have been cautious. And I will fill my pages for him. And when it comes time for my eulogy, let the world know that I lived true to my own soul. That is how I will survive. We won’t see Taylor in ten months. Our reunion has been delayed, but rest assured, there will be one. Moxley Sorrel, who served as Robert E. Lee’s chief of staff, penned these words as he tried to speak of his love for his men. For my part, when the time comes to cross the river like the others, I shall be found asking at the gates above, “Where is the Army of Northern Virgnia?” For there I make my camp. When I cross that river, I will find the bivouac of the Oregon Guard, because I know my brothers and sisters of the 973rd will not be far away. And there, between the two camps, I will find Taylor. Four years ago today, a friend of mine was murdered in the line of duty. 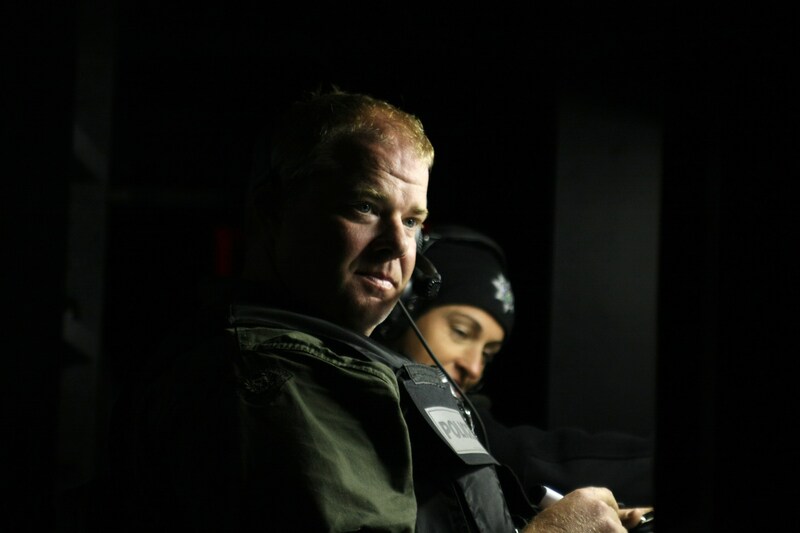 Chris Kilcullen was a police officer and negotiator for the Eugene, Oregon police department. I worked with him in training exercises many times from 08-11 and found him to be a remarkable man. I wrote this article in April 2011 after I got home from his memorial service. The new University of Oregon basketball arena is fantastic. No expense was spared to give the Ducks a special home in what had been the site of Williams Bakery when I attended the school in the 1980’s. I remember waking up in my freshman dorm to the scent of fresh baked bread that first fall away from home, a smell that today can take me right back to those early days of semi-adult freedom and all the joy I felt at having the opportunity to study history. It was an odd homecoming for me. I had not been to the campus since returning from Afghanistan. Frankly, last fall I did not think I would survive my time in theater and never expected to see again the school that became my first home in Oregon. Now that I am back, I never expected to return to it in the way I had to this afternoon. 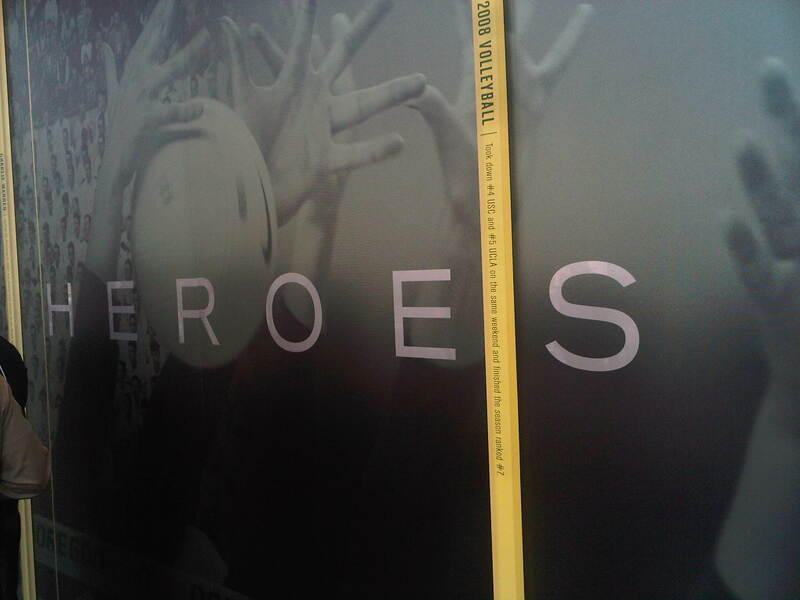 In the arena’s lobby, I stared at the words printed on the main wall, superimposed over enlarged photos of past Duck athletes in action. Being a middle aged Duck, I recognized those words from our fight song, Mighty Oregon. Reading the words reminded me of the summer of ’89 when I worked at the Paul Masson Mountain Winery’s concert series. During intermissions, I had wine pouring duty and I used to give extra vino to anyone who could sing Mighty Oregon. I was amazed at how many Bay Area residents had gone to Oregon, and even more surprised at how many Duck alumni could remember the words to the fight song. Today, those words overlayed across past hardwood glories offended me. I felt a stir of rage. Then tears. How dare we use that word in such context. I stepped into the arena. On the giant screen above the court, the first thing I saw was a photo I took in the fall of 2008. Displayed there for all to see was a true hero, not the false idols found here on game night. In that photo, Chris Kilcullen was full of life, his winning smile exuding charm, his eyes full of mirth. I sank into a seat and thought of the many hostage negotiation exercises we went through together. I’d be on the throw phone role playing a bad guy holding my wife or kids at gun point, screaming irrational demands at Chris. I swore at him. I called him every name I could think of to cause him to lose his cool. I said horrible things about his mother and his wife. 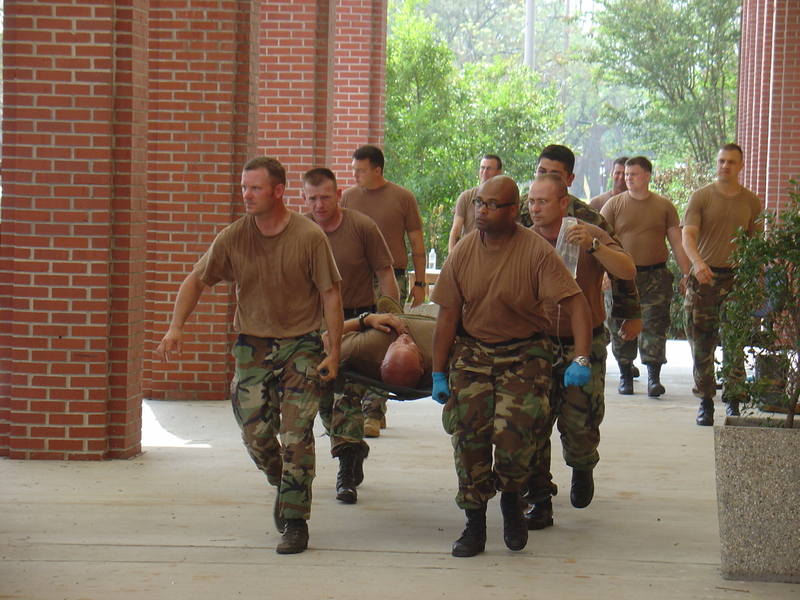 I probed for every weak point a man can have in hopes of causing a flare up, a quick retort or some other slip that we could discuss in the post-exercise after action review. 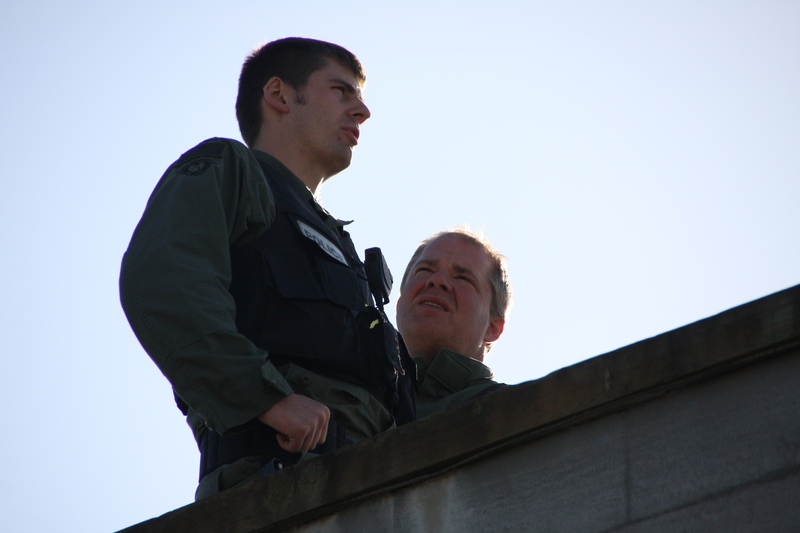 Chris teaching a new negotiator to talk me out of jumping off the city hall building at the Rilea MOUT Range, September 2008. 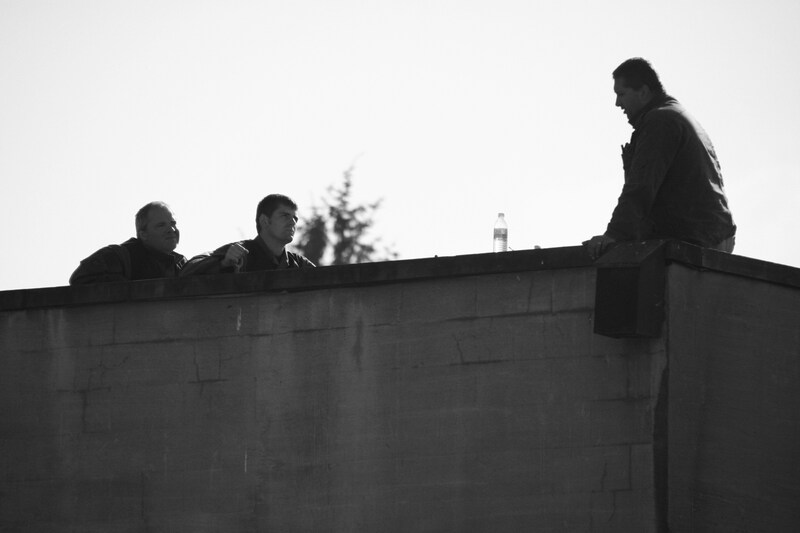 One memorable exercise had Chris teaching a new negotiator how to talk a person out of jumping off a building. That person was me. I jumped. Chris imparted some of his hard-won experience to his protégé, and in the succeeding iterations he talked me off the roof. As I sat in the new arena, I thought about all the vile things I spewed at Chris that never elicited a response. His calm and soothing voice was in my ear at that moment; the consummate professional. But he was more than that. He was a consummate, compassionate human being. 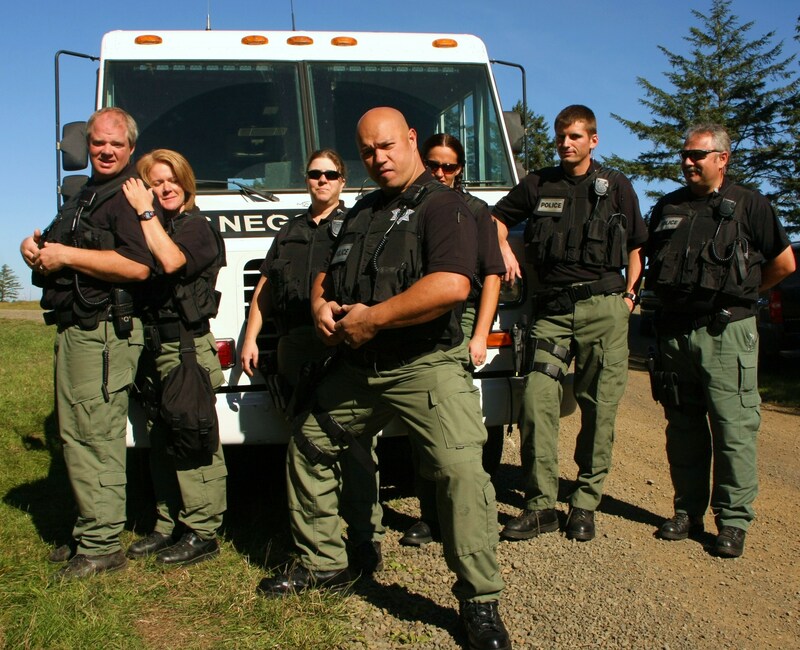 Chris had been with the Eugene Police Department since 1998. He was a motorcycle cop assigned to the traffic unit. This meant he was out there giving people with lead feet (like me) speeding tickets. But he did it in such a charming way that those he ticketed came away feeling better for their chance to interact with him. His spirit shined that bright. It was snuffed out last week by a 56 year old mentally ill woman. She shot at Chris with a .38 after he chased her into Springfield. This great cop, this father of two, this doting husband, died on the streets he devoted his life to keep safe for the rest of us. Exactly how a woman so deranged can legally buy a firearm in this State needs to be addressed. For now, this woman’s rash and senseless act has torn apart a family, and a community. We all need to heal. Coming so soon after Jerry Webber’s death, it was an especially cruel blow to his fellow officers. Over brats and beer in the Rilea starships, I talked cars with Chris. He loved his ‘50’s Chevy pick up that he’d had since his teen years, and it was particularly painful to see it for the first time on the arena floor parked beside the stage erected for the occasion. 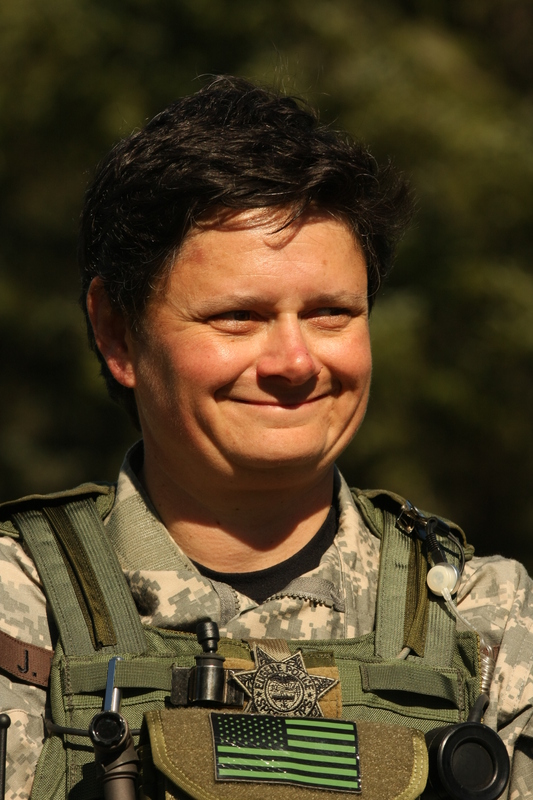 I remember rolling into Eugene in December, 2009, on my way to bring all the photos I’d shot to Lt. Jen Bills. 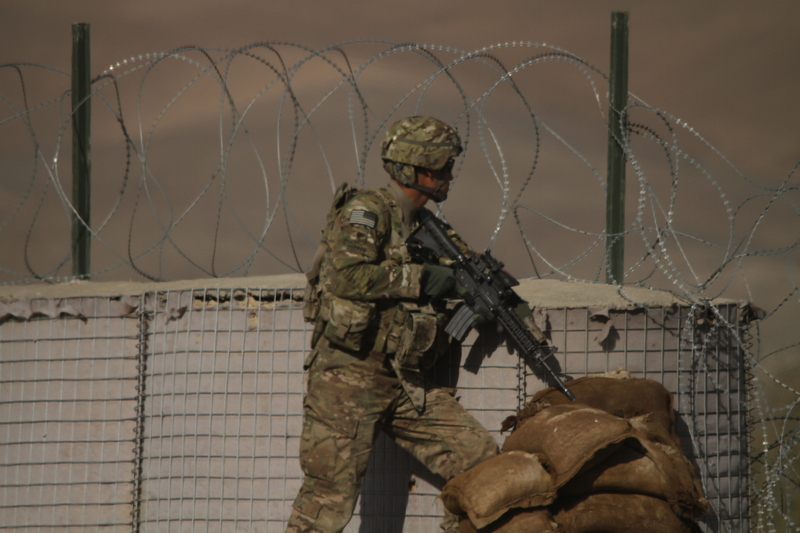 Until I went to Afghanistan, some of the best images I’d taken were during those weeks at Rilea with EPD. I was proud to give them to Jen so that she could share them with everyone else and their families. Little did I know that two of the men I photographed would later die. Driving along 7thStreet, I passed a sleazy downtown motel. Something was amiss, as the place was surrounded by police, and a team of officers looked ready to enter one of the rooms. 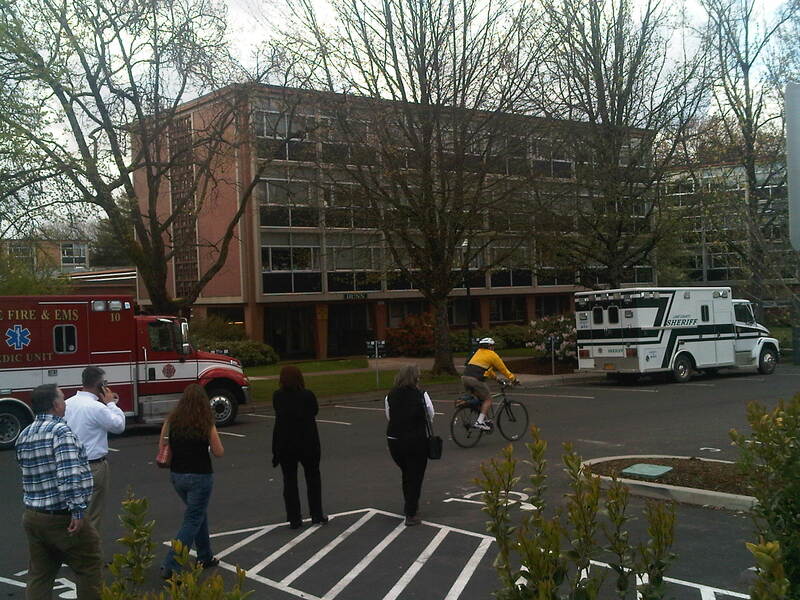 I saw Chris and his motorcycle across the street on the outer cordon and waved at him. I’m not sure if he saw me as I drove past, but even in the middle of the real action, he had a slight grin on his face. Ever the buoyant one, Chris Kilcullen. He was in his element. 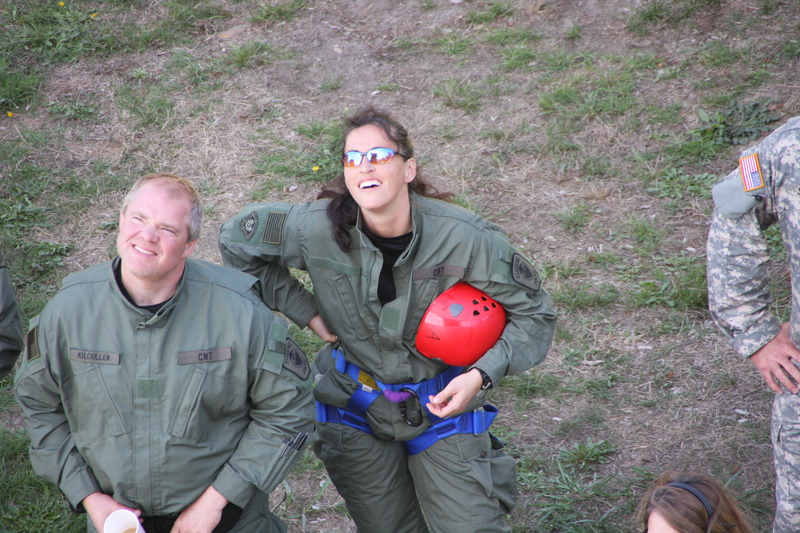 It was a surprise to see the officers in a real world environment instead of the training range. As I parked at the station, a surge of pride went through me—in some small way I felt like I had a part in all this. Those weeks off from writing and away from my family to serve as a tackling dummy for the EPD never seemed more worthwhile. Perhaps some of the lessons helped the SWAT and CNT folks learn would be of use out in the field after all. But all those iterations at Rilea failed to save Chris from a lone crazy armed with a pistol she never should have been able to obtain. I don’t have the space in my heart left to feel guilty about that—Taylor’s death owns that real estate—but I couldn’t help but second guess some of the things I’d done during those training weeks. Could I have done something different that could have given Chris the edge he needed to survive this woman’s surprise onslaught? I imagine, there’s a lot of that going around right now. 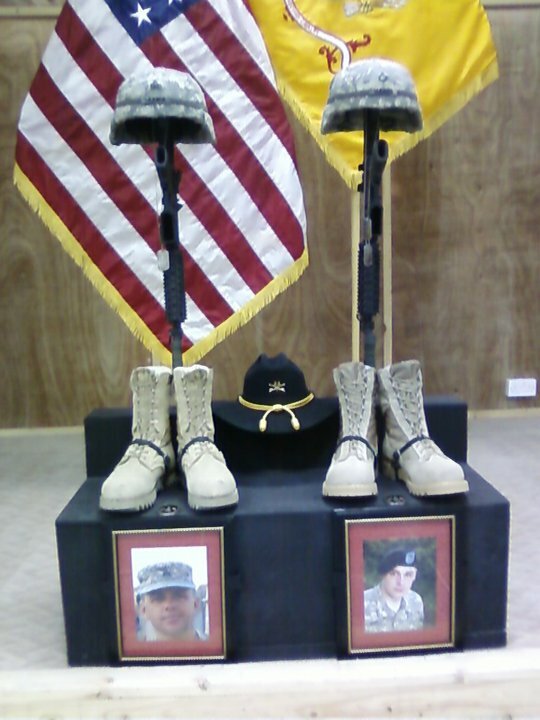 And I remembered writing about two soldiers soldiers who died in Iraq during an IED attack. The men in that platoon were quick to blame some of the decisions made on that patrol. Recriminations lingered and left some of the men embittered. From an outsider’s perspective, I thought the men had gotten it all wrong. The decisions were of no consequence. The insurgent who triggered the bomb killed those men. War happens. The bad guys cause damage despite every precaution and care taken. That’s just the nature of the business. And so it is with Chris’ death. Nobody is responsible but the woman who chose murder over a ticket. Finally, I could not take any more. 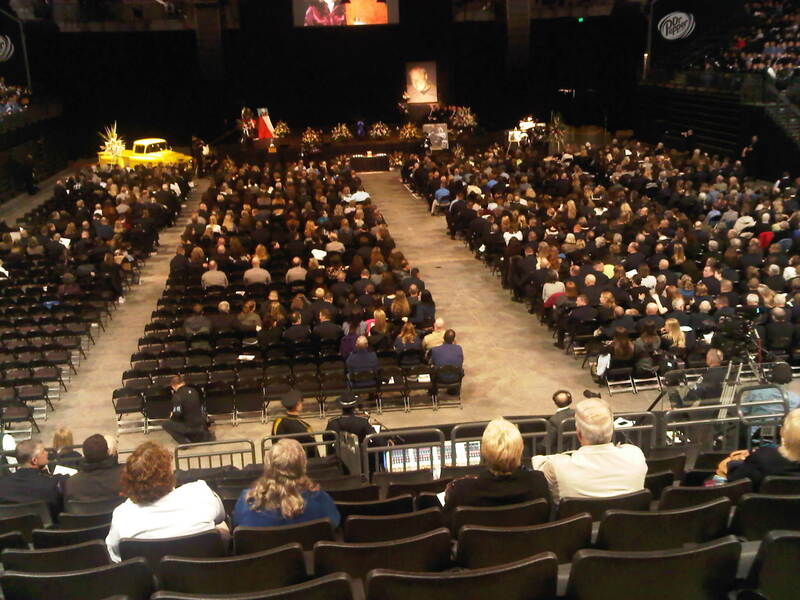 Two years, four funerals—Jon Hudson, Taylor Marks, Jerry Webber and now Chris. I go through life with my heart wide open, but these past months have caused me to withdraw and be more protective of myself. Now, I felt raw again. I stepped into the lobby and walked to the huge windows overlooking campus. Across the street, I saw my freshman dorm, Dunn Hall. Third floor, center. There was my window shared with my first roomie, Chet Nakada. Chris was born a month and four days after I was in 1968. He went to Willamette High, class of ’86. He started at the U of O the same time I was there. I wondered if we crossed paths on campus all those years ago. Perhaps we had one of those massive lecture classes like Western Civ together. I’ll never know. But he was there, sharing the experience of the university just as I had, tasting those first sweet moments of freedom right along with the rest of us. Jen Bills. 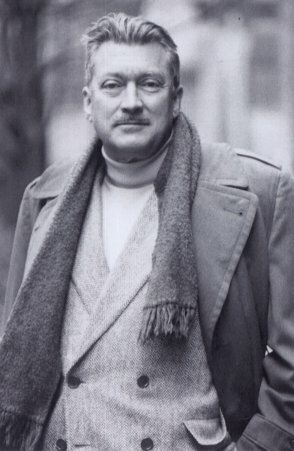 Mark Farley. My wife, Jennifer Beggs. We were all in the student body together. In time, our lives would come together in unexpected ways, and I wondered what we would have thought of that if we had such foreknowledge back then. I stared at my old dorm room window and thought of dancing in the hallways. Water gun fights. The great Dunn Bun War that left our floor littered with hundreds of stale hot dog and hamburger buns the night before Christmas break. I thought of tender moments shared in the predawn hours with my first college love, waking in her arms to the delicious aroma of fresh baked bread. I once told her that I’d live in a cave if I had to just to be an historian and do what I loved. She didn’t like that thought. She had dreams of material wealth, big houses and dinner parties, little black dresses and rooms captivated by her charisma. But I’ll say this: mine has not been an easy professional path. Moments like this one, these farewells to friends and colleagues torn from this life through violence or circumstance weighs heavily on me, and makes carrying the work forward increasingly hard. I turned away from the window and that idealistic gestational phase of my life. I needed to say a proper goodbye to a man whose noble heart had earned my respect and admiration. I walked through the lobby and saw those words again. So misplaced on that wall. There are no heroes on the hardwood, only athletes with heart and grit. Respectable, sure. Heroic, never. 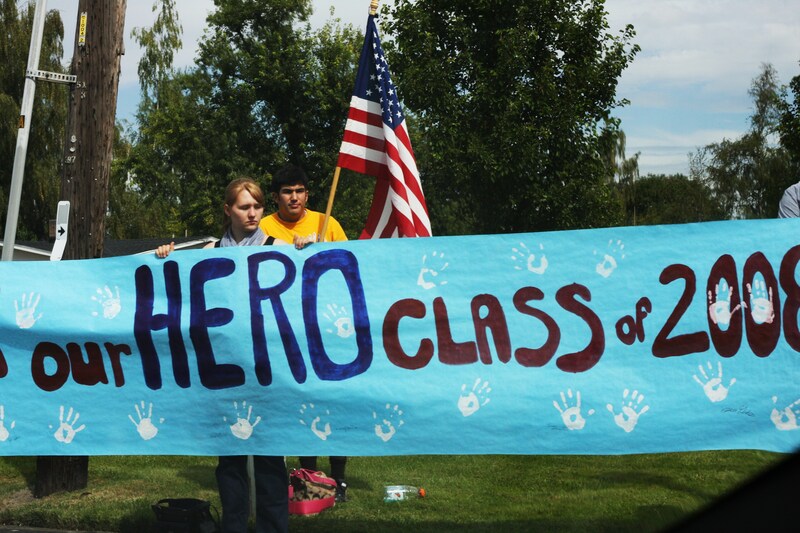 Americans misuse the word “hero” all the time. It has become an ingrained cultural error, one that demeans the service and spirit of the true heroes whose lives are spent in service for the greater good. Suddenly, I didn’t feel so worn down. 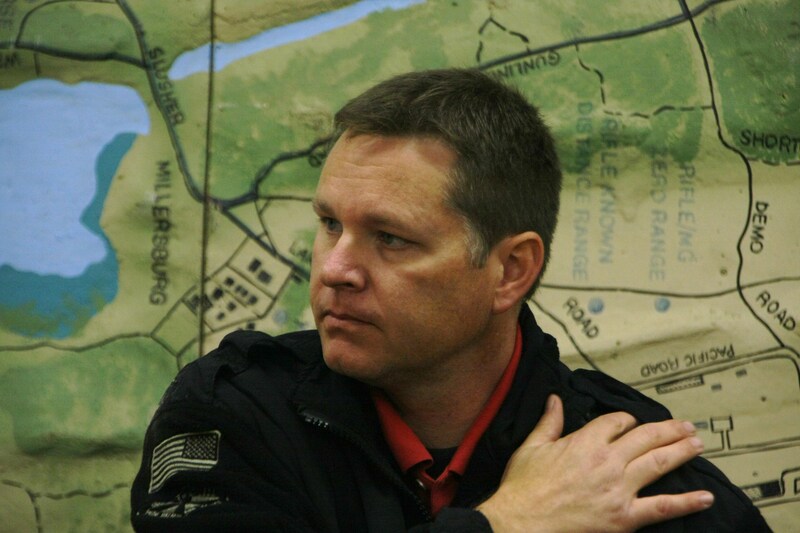 Chris Kilcullen dedicated his life to protecting us. I’ve spent my life making sure men and women like him are not forgotten. That is my purpose, my crusade. And in that pursuit, I connected with Chris. We were both men devoted to our callings. The big house my college sweetheart so coveted has eluded me. Coming home from Afghanistan, the financial mountain I face is a scary one. No matter. I’ve known heroes. I’ve seen them in action here at home. I walked the ruined streets of New Orleans with them. I flew into battle with them last fall. In the final judgment, that is all I need out of life. I returned to the arena, suffused with sadness, but rededicated to all I’ve predicated my life upon. Somewhere in the years behind us, the kid I once was stared out that dorm window dreaming of doing the things I have done. If he could see me now, I’d tell him only one thing: I’ll keep the faith. I owe it to men like Chris.